Ready mixed top coat plaster, composed of high strength white cement, reinforced with acrylic resins. 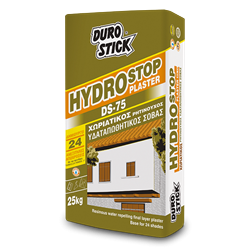 Offers excellent resistance to moisture and frost, without blocking the water vapour permeability of surfaces. Suitable for interior and exterior applications, on surfaces made of bricks, cement blocks, aircrete and concrete. Easily colored in 24 permanent colors, with the addition of pigments in powder form DUROCOLOR POWDER-C into the mixing water, before the plaster is added. Just by adding water, create a textured, (Rustic), decorative and durable finish. Classified GP: CSIV/W2 per ΕΝ 998-1.